Another car post. I have to admit that the topic had already been covered in depth. 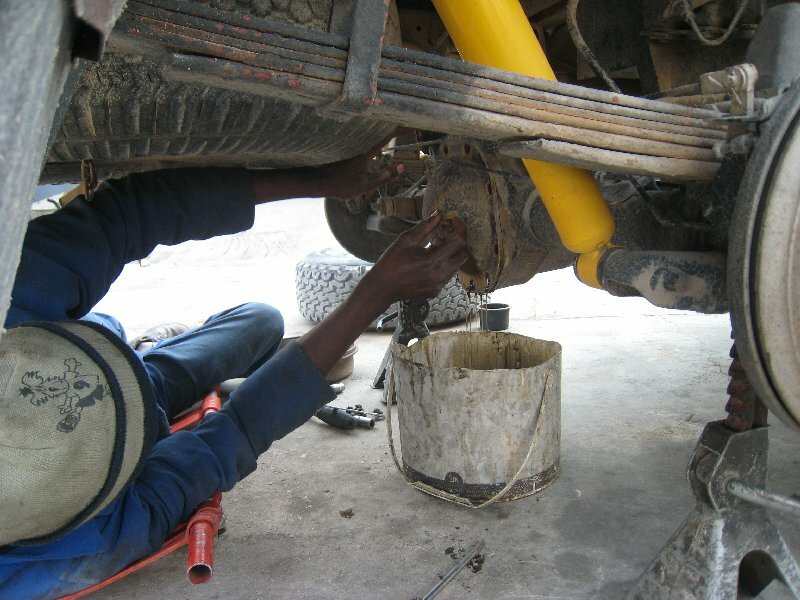 Trouble is that a car is an (or even THE) essential part of daily life in Northern Namibia. In June I went down to Windhoek for a week to get rid of my unreliable Mazda Drifter and take over the Toyota Hilux of Beat and Tanja, a couple from my organization who finished their assignment in the country. In one of the previous posts I’ve done some aggressive advertising for the Toyota Hilux model based on pure ‘desk research’. After three months and 6000km behind the wheel – the verdict: it’s simply running like a clockwork although it already has 239’000 on the odometer. The design of my Hilux (fourth generation, produced 1996 in South Africa) goes back to 1983 and it has the legendary 22R engine. Cruising speed and comfort had not been a priority back then. Thanks to that (and the fuel price) speeding is virtually impossible – 100km/h is the maximum speed when traveling on the paved road. 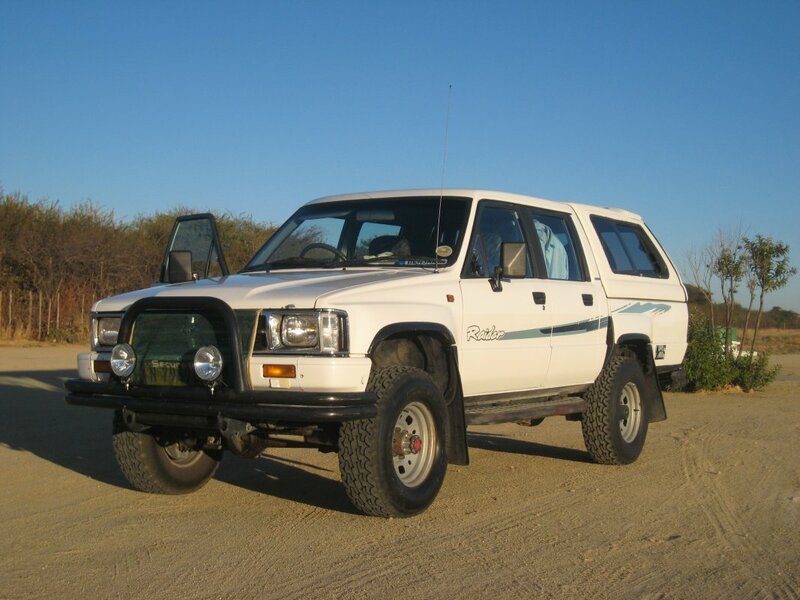 As mentioned also a Hilux (aka ‘The Indestructible Truck’) won’t save you from car troubles. Last weekend the exhaust pipe broke (I knew that the pipe was dangerous thin). Instead of crawling into the bed I had to go under the car twice in pitch dark on my way to Oshakati – amazing what you can fix with heat resistant duck tape, wire and a flat bar! Die Blogeinträge sind nur die Spitze des Eisberges: Im Ministry vergeht eigentlich kein Tag ohne, dass du das Gefühl bekommst in der Klappsmühle gelandet zu sein;-). Zurück in der Schweiz werde ich meinen Führerschein in einem Bankfach deponieren: ÖV existiert hier de facto nicht – mal abgesehen von den Corolla ‘Taxis’ und Minibusen, wo du gute Chancen hast in einem Crash zu enden (schlechte Wartung, Raserei etc.). Die privaten 6000km sind Peanuts im Vergleich zu den Öko-Punkten die ich hier im Government Car sammle: Mein TAGESrekord letzten Monat liegt bei 550km – zum Glück sind unsere geleasten SUV’s 2009er Modelle, haben (noch) Herstellergarantie und teilweise Airbags. Die Abhängigkeit von Fahrzeugen wird dem Ministry (oder dem ganzen Land) früher oder später auf die Füsse fallen. Die Rechnung (Leasing+Sprit) eines unserer 4×4 Double Cabs vom vorletzten Monat: ~19’000 NAD – 2700 CHF!. Klar, es lässt sich einiges optimieren (‘Auslastung’+Streckenplanung) – doch die riesigen Distanzen bleiben – und es nur ein Frage der Zeit bis die Benzinpreise steigen. in my blog whether you don’t mind. Natually I’ll give you a link on your own net blog.